Accompanying your older adult to their doctor’s appointments is important, but can be a tough challenge. While you’re there, you might disagree on what to discuss, they might lie about their symptoms, or they may refuse to discuss sensitive topics. It can also be tough to find the right balance between letting them speak for themselves and stepping in to bring up important topics or clarify key facts. But even though you might not want to “take over,” your older adult might need help asking the right questions or understanding instructions. Or, they may need a strong advocate if the doctor isn’t giving them the attention they deserve or asks them to make big decisions without explaining the risks. We found a helpful guide from Next Step in Care with practical tips that help you and your older adult coordinate your approach. This helps you avoid conflicts and get the most out of the doctor’s appointment. Here, we summarize key points from the guide. Before the doctor’s appointment, preparing in advance sets the stage for success. Try to schedule the appointment for times that work best for both your older adult and you – when they have the most energy and when you’re able to set aside enough time. Because there are two people involved in the visit, it’s important to make sure you’re in agreement on what concerns to bring up and how they will be discussed. For example, you might both agree to discuss their recent swallowing problems, but they refuse to discuss your concerns about their driving and judgement. They might also have concerns about incontinence symptoms, but don’t want to talk about it in front of you. What might work best is to discuss the top 1 or 2 agreed-upon issues together with the doctor. Then, let your older adult know that you’ll step out so they can privately discuss sensitive issues. 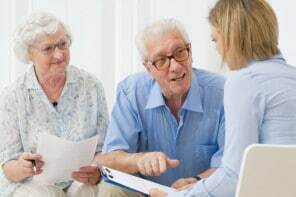 When you need to talk with the doctor about issues that your older adult refuses to discuss, it might be best to do it alone before or after the visit. For example, your older adult might get angry, defensive, or lie if you bring up driving problems or potential cognitive issues. Many doctors are willing to schedule a phone call to talk privately. If that’s the case, be mindful of their limited time and stick to only the issues that you can’t discuss when your older adult is present. Before the appointment, it helps to talk with your older adult to find out how they’d like you to help. They might want you to stay in the waiting room or come into the exam room for part or all of the visit. In the room, they may want you to only take notes or to remind them of the key issues to discuss. You could make sure that important information, like new medication, is clear. Discussing this ahead of time helps your older adult relax because they’ll know that you won’t be “taking over” without their consent. Of course, if your older adult has significant cognitive impairment or isn’t able to communicate, you’ll naturally be taking a more active role. During the appointment, let the doctor know that you will both be participating in the visit. When possible, allow your older adult to answer questions and speak for themselves. But if there’s a situation where they need help, you may need to speak up. For example, if doctor hasn’t given enough information, but is asking them to make a decision, step in and ask them to clarify. Or, something the doctor has said is conflicting with something a different specialist has said. Let them know and ask them to explain. And if the doctor has asked you to perform a new care task, like taking care of a wound, make sure that you clearly understand how to do it. Don’t be afraid to ask questions, watch a demonstration, or request training. After the appointment, it’s often helpful to chat about how it went. You can find out if they thought it was a good visit – why or why not? Specifically, you could ask if they felt you asked the right amount of questions, if they wanted alone time with the doctor, or if there was something they wished had happened differently.